You’ll only like this one if you, like me, are a fan of Mo Willems. (It’s for personal use, so I’m not trying to do anything evil here with copyright.) 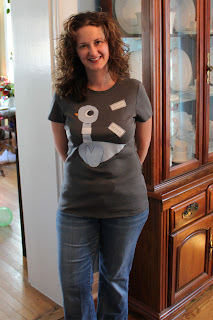 I cut out, ironed-on and stitched down a pigeon figure inspired by the book, then printed the word “drive” three times on printable fabric and ironed those on around him. Dorothy likes this one too. I had a hard time photographing this shirt. It is another long sleeve tee like the ones in the last post. 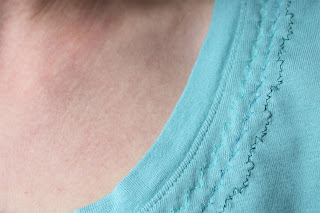 I used different colored thread and the decorative stitches on my sewing machine to create a border around the neckline and waist. The effect turned out pretty well and I think it makes this shirt look sort of mail order catalog-y, in a good way. 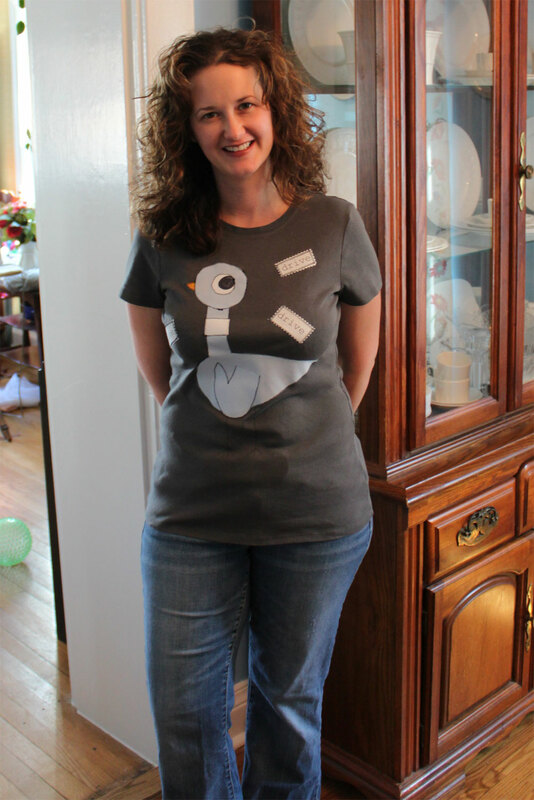 This was a really rewarding project because it was so quick and simple and made such a difference in the shirt. I wouldn’t try this with a dull needle–decorative stitches on knit need a sharp, fresh needle designed for knits. I recently ordered this book on crochet motifs, mostly because I was a little short of the free shipping threshold when I was ordering something more urgent (how much money does Amazon.com make that way? so brilliant!) and I really like it. The little shapes can be the building blocks for any larger project one can imagine, but they are also fun little quick projects on their own. I was feeling frustrated with our cheap, stupid (yes, I have a 4-year-old and I know “stupid” is a bad word) tea kettle because the stupid product designers made the handle out of some material that heats up so much when water is boiled in the kettle that unsuspecting, innocent tea drinkers get their hands burned every time they fail to remember that this stupid kettle isn’t like every other kettle they’ve ever owned, and that they can’t touch the stupid handle to pour the water out when the stupid thing whistles. Tired of reaching for a potholder just to pour water (or failing to), I decided to crochet something decorative and insulating to stay on the stupid thing to avoid this problem in the future. I made one of the hexagons in the book and tied it right onto the handle at the points. 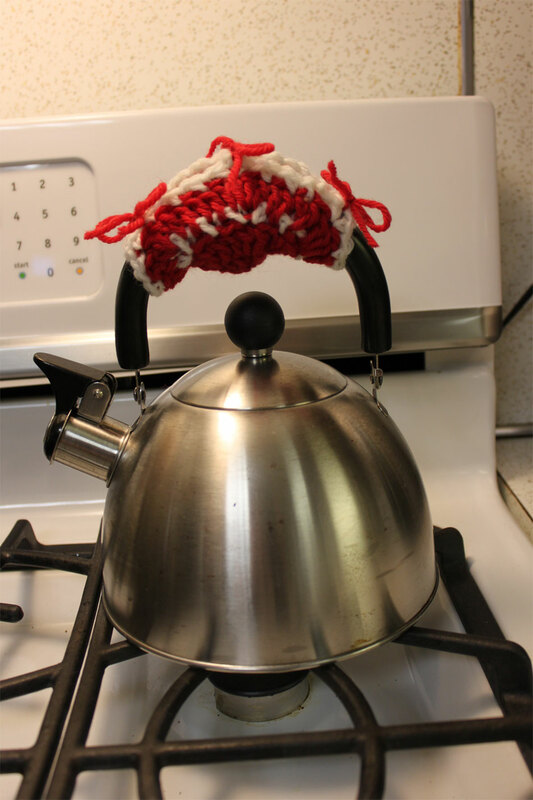 The red and white wool matches my kitchen, so now the stupid kettle looks prettier too. If anyone thinks that a person who repeatedly burns their hands making tea is a little bit stupid herself…well, no one asked you. The kids and I are off on an adventure tomorrow. The car is packed, the MP3 player loaded, and a basket is well-stocked with snacks. We’re headed to Chicago to visit my college roommate. I used to travel quite often with just Dorothy before Worth was born but our preschool schedule and being outnumbered by my kids has kept me home more this past year. I’m hoping that all goes well so we can make travel a regular part of our homeschooling experience next year. On this trip we’re hoping to take in a St. Patrick’s Day festival at the Irish Heritage Center and the children’s museum. I have used my mother’s trick of wrapping small gifts in old newspaper to hand out to the kids at regular intervals to keep them happy in the car. Some art supplies, a tiny backhoe that makes noise, books…I think they will be well received.